(Phys.org)—A team of researchers working at Germany's University of Würzburg has shown that a theory developed to describe a way to convert waste heat in microelectronics to electricity can work in the real world. In their paper published in the journal Physical Review Letters, the team describes how they used quantum dots to create a three terminal device capable of generating electricity by harvesting waste heat. As microelectronics have grown smaller, the problem of waste heat has grown bigger—not only does excess heat create problems for system components, it also represents wasted energy. If that heat could be converted to electricity and used to help run devices, it would allow them to run longer while using less battery power. In this new effort, the team working in Germany reports on experiments they conducted using quantum dots—and idea proposed four years ago by a team working at the University of Geneva—they envisioned using quantum dots to construct a three terminal device that would allow an electrical charge generated from a heat difference to pass from one terminal to another without allowing the heat to transfer as well. In their lab, they built a rectifier (a device that converts AC current to DC) based on two types of quantum dots, one made of gallium arsenide, the other aluminum gallium arsenide. One of the dots was affixed to an electric circuit, which provided alternating current in the form of voltage fluctuations—the other dot served as the receiver allowing direct current to flow out. It should be noted that the researchers have not actually converted waste heat to electricity, instead they have used voltage fluctuations from a voltage source to mimic the process, which they claim, proves the original idea could work. They were forced to take this route because the technology does not yet exist to measure the differences between the two dots accurately. The next step will be to modify the device to convert the waste heat directly to electricity and then to figure out a way to measure the results. The team appears confident their approach will work and predict such devices will soon make their way into actual products. We study the rectification of voltage fluctuations in a system consisting of two Coulomb-coupled quantum dots. 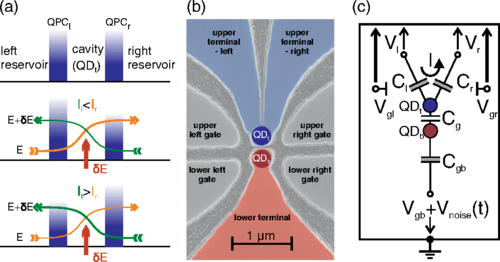 The first quantum dot is connected to a reservoir where voltage fluctuations are supplied and the second one is attached to two separate leads via asymmetric and energy-dependent transport barriers. We observe a rectified output current through the second quantum dot depending quadratically on the noise amplitude supplied to the other Coulomb-coupled quantum dot. The current magnitude and direction can be switched by external gates, and maximum output currents are found in the nA region. The rectification delivers output powers in the pW region. Future devices derived from our sample may be applied for energy harvesting on the nanoscale beneficial for autonomous and energy-efficient electronic applications. Energy harvesting can reduce out need for supplemental fuels, and help get us off the Petroleum Teat. Those who say we cannot do it are not up to date on technologies. Poco a poco, we are transitioning over to clean fuels. Busted at Fukushima and Chernobyl. Nuclear is pointless. Apart from the problems with resources (another dependency on forign countries and bidding for resources), the waste problem, and the risks of contamination of many more areas than have already been written off: It'd take way too long to scale up to the point where it would make an appreciable dent in energy production. There are only a couple of companies that can even build nuclear reactors and they can't build dozens (let alone hundreds or thousands) of reactors at the same time that would be needed. If you see another alternative for the Chinese than either building nuclear plants or building coal plants, I'd love to hear it, antialias. Meanwhile, back on topic, what an interesting discovery. This seems to extend the possibility of reducing energy usage to the point where nanomachines can work using ambient heat. "If you see another alternative for the Chinese than either building nuclear plants or building coal plants, I'd love to hear it, antialias." Just google China and renewable, and find out that China leads the world in Alternative Energy. But they still have a plan to build thousands of coal-fired electric plants. Come talk to me when they cancel that, Gracie. Until then, alternative energy is handwaving and is a political exercise, not real engineering that they believe will solve their problem. It's not me you have to convince, Gracie, and every "one" rating you do proves you're too immature to understand why.